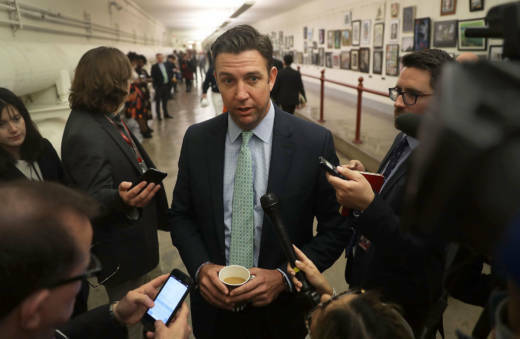 SAN DIEGO — Congressman Duncan Hunter and his wife were indicted Tuesday on federal charges that they used more than $250,000 in campaign funds for personal expenses that ranged from groceries to golf trips and lied about it in federal filings, prosecutors said. Hunter, a Republican, and his wife Margaret Hunter were named in a 48-page indictment filed in San Diego federal court. Hunter represents California's 50th congressional district, which spans much of inland San Diego County. "Throughout the relevant period, the Hunters spent substantially more than they earned," the indictment said. "They overdrew their bank account more than 1,100 times in a 7-year period resulting in approximately $37,761 in 'overdraft' and 'insufficient funds' bank fees." Asked for comment about the indictment, a representative for Hunter sent an Aug. 6 letter from Hunter's attorney, Gregory A. Vega, to U.S. Deputy Attorney General Rod J. Rosenstein asking him to postpone the indictment. Vega contended that there was a "rush to indict" after a two-year grand jury investigation. The House Ethics panel had investigated allegations that Hunter improperly used campaign funds to pay for tens of thousands of dollars in personal expenses, such as trips to Hawaii and Italy and tuition for Hunter's children. Hunter's office said at the time that one of the charges he repaid was a $600 fee for flying a pet bunny with his family. There was no intent to stick donors with the cost, Hunter spokesman Joe Kasper said at the time. The congressman used airline miles to pay for his family's travel and there was an assumption that bringing along the rabbit would not incur an extra charge, Kasper told The Associated Press.